Since as early as 2008, Scrum has increasingly become our methodology of choice for the vast majority of projects. We now heavily favor Scrum to successfully cope with loosely defined or constantly changing requirements, or critical time to market demands. Over the years, we have accumulated deep Scrum software development expertise and take pride in employing some of the best Scrum Masters out there who not only effectively lead projects but also constantly contribute to the company’s body of Scrum knowledge. We also have worked hard to hone our process to specifically address the challenges of outsourced development — and it has paid off tremendously when delivering products for some of the world’s most recognizable brands such as Google and Discovery Communications. Iterative and incremental, Scrum software development methodology is designed to build products faster. Scrum uses short timeboxed development cycles (called sprints), with each sprint resulting in potentially shippable functionality delivered. Scrum underscores close interaction between the development team, the Scrum Master (SM), and the Product Owner (PO). The three parties rely on constant communication to formalize requirements for the next sprint, discuss progress in the current one, and report on the work done. Are you trying to release faster and more frequently without sacrificing quality in the process? Do you need greater development predictability amidst changing requirements? Let us show you how our Scrum software development approach can help. Each project has its own Scrum dashboard that offers powerful analysis tools to help Scrum Master and Product Owner better track the implementation of sprint objectives. 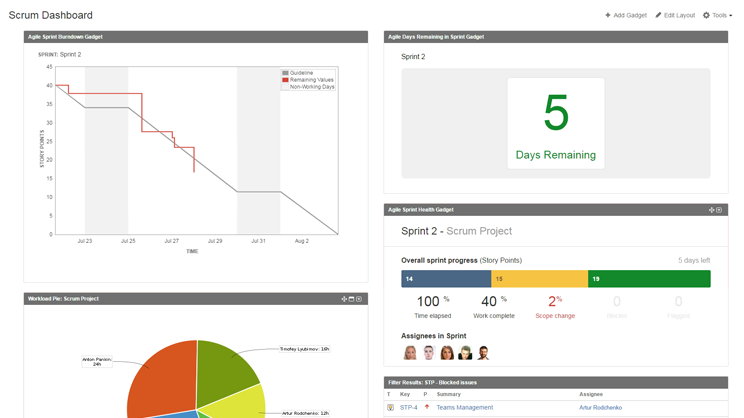 Every sprint has a dedicated Agile Board, which provides a flexible way of viewing, managing, and reporting on sprint-related work. Each project has a well-defined baseline story, which makes for accurate effort estimations and predictable value delivery. Definition of Ready ensures stories are clear, have accurate estimates, and are ready for implementation. This decreases risks and increases predictability of the overall release plan. Each project has a dedicated DoR preparation board designed to monitor the story preparation process and ensure all DoR stages are properly implemented. Definition of Done lists all the activities for a story to be release-ready. These include code and unit test completion, code review and/or refactoring, testing, bug fixing, documentation updates, and more. 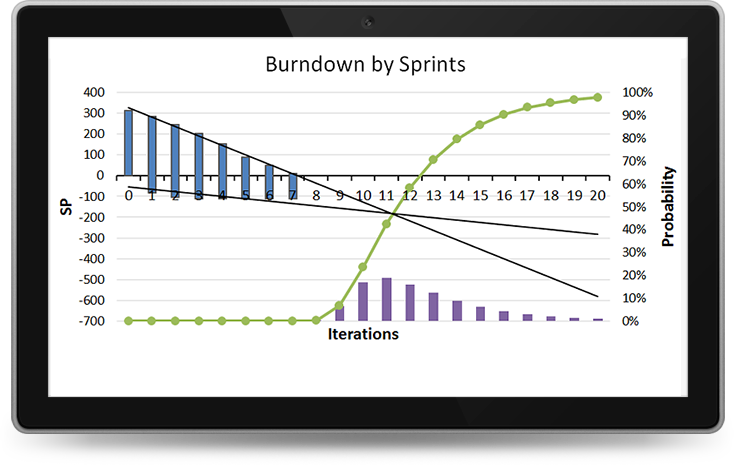 Each project uses an Enhanced Burndown Chart, which allows easily tracking project health, predicting project completion date, and monitoring the remaining budget. Scrum methodology allows getting started fast. During sprint 0, we process the initial high-level requirements for sprint 1, and set up the project infrastructure. For maximum speed, we automate project environment provisioning, including issue tracking, reporting dashboards, code repositories, development servers, and more. Our approach sets much store by risk management and mitigation. We have detailed procedures in place that allow identifying risks early and proposing the optimal risk tackling strategies to ensure the project’s success. Unlike the traditional Waterfall approach, Scrum methodology welcomes change, even late in development. We implement well-defined procedures for transparent requirements management, efficient scope breakdown, and backlog refinement and control. Scrum depends on maximum transparency for success. We utilize tangible progress and process metrics and offer custom dashboards that make it easy to keep tabs on the development velocity, instantly view blockers, and predict team performance at a glance. Scrum emphasizes delivering business value with every sprint, which should result in a potentially shippable increment (PSI). After project kick-off, our Scrum team will deliver your first working demo within 4 weeks (which includes sprint 0 and sprint 1). We make it a point to stay abreast of the latest developments within the Scrum arena, while constantly investing in our Scrum Masters’ education. Most of our SMs are Scrum Alliance Certified ScrumMasters®. Our Scrum Masters are well-trained to assume several of the PO’s responsibilities. Our SMs monitor and control the project’s schedule, budget, scope, and quality, as well as assist POs in gathering the requirements, managing release plans, and monitoring the project ROI. Oxagile’s Scrum process fully complies with the widely recognized Scrum software development framework requirements. We have also improved upon the standard framework in many ways to provide greater predictability and progress visibility, and mitigate project risks. A software development partner I can rely on. I must say that I had been somewhat wary of entrusting the development into the hands of developers that were thousands of miles away, but the very first week of our work dispelled my doubts and gave me the much needed confidence. Oxagile managed to set up a Scrum-based process that ensured we lost little to no time elaborating the requirements, creating user stories, filling up the backlog and moving on to development. I will definitely recommend Oxagile to anyone considering to outsource the development of an innovative solution — the company delivers on their promises and is always there to help. Drop us a message, and a Scrum expert will get back to you shortly to discuss the optimal development strategy based on your budget and duration requirements.